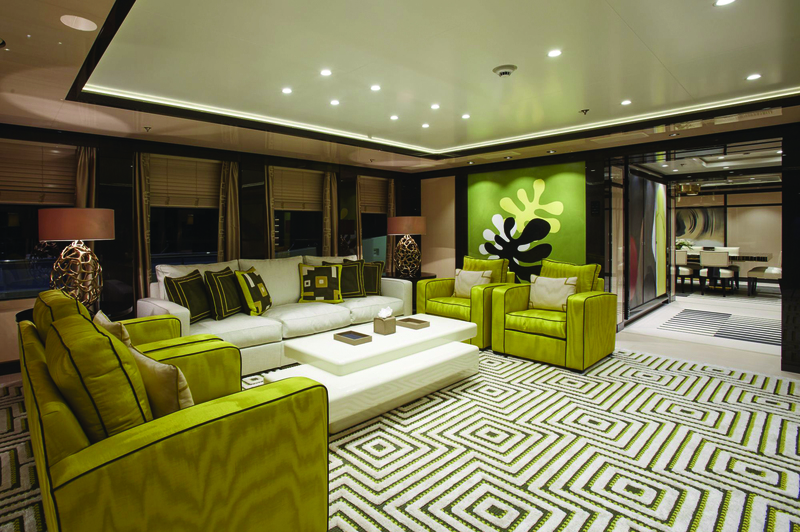 Neil Grant, Harris Grant, outlines the unique challenge of creating state-of-the-art living spaces for clients who demand the finest entertainment on board their superyachts. Nobody said being an interior designer was an easy calling. We’re all familiar with the demands of discerning clients with stratospheric standards who expect, quite rightly, the realisation of a show-stopping living space that exudes effortless and (usually) understated luxury. There’s quite enough to think about when the job is in the static confines of a private house or apartment. But the challenges multiply rapidly when you’re commissioned to work your creative magic on board a superyacht. It’s a uniquely testing environment for all sorts of reasons, and one that sparks designers to respond with equally imaginative solutions. Things are very different when you’re on open water. There are extremes in humidity, temperature, UV light and mechanical vibration to contend with: constraints you’ll seldom encounter in a penthouse in land-locked Kensington. So that immediately impacts on specifying the use of veneers, lacquers and other fragile finishes that can degrade with frightening rapidity in a marine setting. Then there’s the whole issue of compliance. A stunning architectural dining table has to meet exacting maritime safety regulations: it’s more akin to designing for the first-class cabin of a passenger jet, where every salt cellar and scatter cushion is rigorously assessed for flightworthiness. 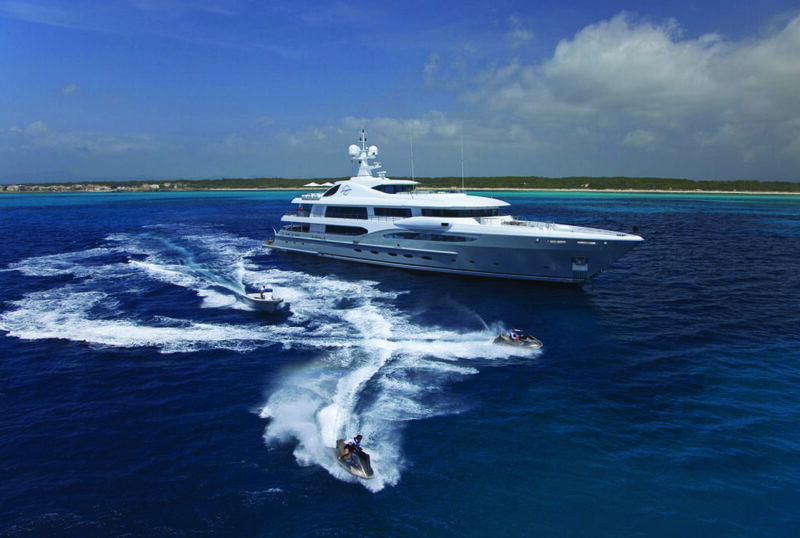 Things get even more complex when integrated audiovisual entertainment and IT systems enter the mix, as happens routinely on a modern superyacht. At Harris Grant we started out some 30 years ago, designing studios for musicians like Peter Gabriel to record music in relaxing and highly personal yet technologically sophisticated spaces. Today we take enormous pains to ensure that marine clients can enjoy music, films and TV in their private movie theatre or dining area with the same fidelity they’d expect in a Soho production suite. The largest yacht is surprisingly tight on space compared with even a modestly-dimensioned apartment, with a geometry that’s anything but regular. So right away you’re facing a whole set of complex acoustic constraints. If you’re building a recording studio from scratch, you’ve got total control over the placement of walls, surfaces and furniture that profoundly shape the sound you hear. At sea, it’s a whole different deal when your client insists on installing a snug lower-deck movie screening room just a few metres from the engine room. The biggest challenge we face with every marine commission is cabling. As designers, we hate unsightly wires as much as our customers, who expect TV and hi-fi systems to mesh invisibly with the rest of the decor. Power, data, control, audio and video must be carried through tight conduits running the length of the ship, crossing watertight bulkheads every few metres. With shipyards and boat owners budgeting for a minimum 10-year interval between refits, everything must be carefully considered from the outset. Unlike re-wiring a house you can’t just pull up floorboards to run extra cables at the client’s whim, even on board the most lavishly scaled boats. 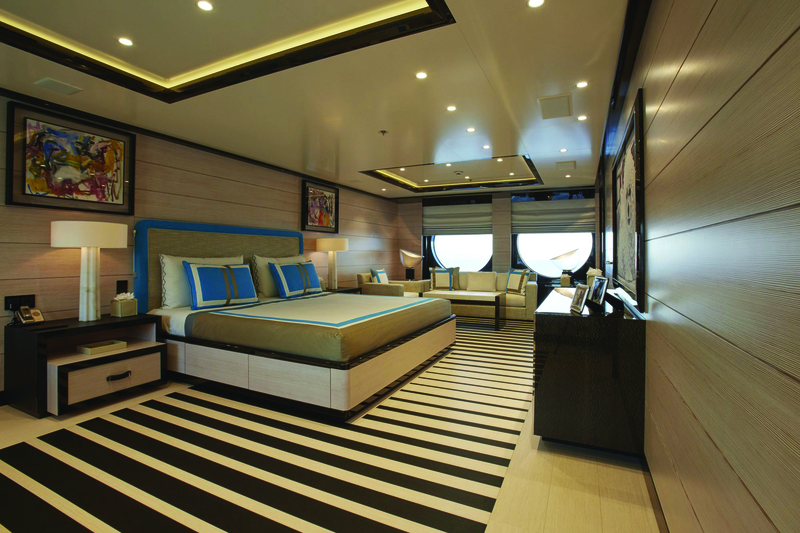 And that’s where technologies like KNX are a godsend, allowing marine designers to expand and re-configure environmental and entertainment control systems with minimum disruption.